Yes, you really don’t need opening images (or images of any sort) on a website page visited by people who just want a quick path to complete the task that brought them to the page. That’s especially true of internal pages for use by current students and faculty. And thus, the University of Missouri Registrar’s page excels. If you’re looking for something and not quite sure where to find it, use the highly visible “search” box at the top of the page. In Customer Carewords surveys of audiences using higher education websites, faculty and current students are always the people least satisfied with their experience on a site. The reason? Bad navigation. They can’t easily find the path to complete the tasks that are most important to them. Mizzou has taken an important step to fix that problem. If you’re a long-time Link of the Week reader you just might remember that an earlier but very similar version of this site was featured in May of 2009. Special kudos for resisting any impulses that might have come along since then to change things for the sake of change. That’s rare. Google in March made major changes to the “Test My Site” tool. Among other points, speed is now rated using a 4G standard rather than the 3G level that Google told us until March 70 percent of people are still using to access mobile sites. Comparison with past Link of the Week mobile speed reports isn’t valid. Under the new system, University of Missouri Registrar was rated as “average” at 1.9 seconds to download. A new point… Google now gives you the ability to add up to 9 URLs from competitor sites for comparative speed ratings. Do that. If the result shows that your site is slower than your key competitors that might give you new internal leverage to increase attention and resources to the need for a faster website. Every second you can reduce download time more visitors will stay with your page. 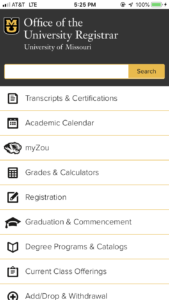 How does your Registrar’s site compare with Mizzou? If yours is faster, tell us here and include a link to the site. People come to a Registrar’s website to complete tasks. As fast as possible. See how University of Missouri Registrar’s site makes that happen with 12 easy-to-scan content blocks.